Premium content has always sold for a premium price; particularly in the more developed, wealthier markets. No surprise then that two or three territories often make up most of the revenue for a rightsholder with numerous smaller markets making up the rest. Rightsholder and broadcaster business models are built around this kind of regional pricing with exclusivity driving the highest prices under the principle that if there is only one channel showing the latest blockbuster, they will get all the eyeballs. And thus, be able to reach the market-penetration, ratings and revenues they need. Mainstream use of anonymizer services such as VPN or DNS Proxy to spoof an IP address to appear in another location. A survey by Global Web Index in October 2017 found 1 in 4 internet users use a VPN monthly – primarily to access the same content for free or cheaply internationally. In a recent Quartz article, VPN providers – with tens of millions of users – have admitted that they see big spikes in traffic during major sporting events and show releases. One of them, ExpressVPN, noted a 10% increase in traffic on Super Bowl weekend while Brazil’s Summer Olympics boosted traffic by 17%. Unlike a static landline IP address, mobile operators assign IPs randomly and thus it is impossible to attribute location. This is particularly challenging for US DMAs and Live IPTV. Furthermore, if you roam with a mobile device abroad the IP address still points to the country of origin. According to Cisco’s VNI forecast, consumer mobile video traffic will quadruple 2017-21 as mobile data becomes cheaper and faster. For this reason, rightsholders are increasingly mandating to OTT broadcasters that geo-blocking methods are improved – sometimes with the threat of pulling the content plug! You can argue that most users still use static landline connections when streaming and that there are effective defenses against geo-piracy. This is true, a good IP fraud detection service that’s properly integrated can block anonymizer IPs, rendering them unusable. But anonymizer services have woken up to this fact, and that their paying customers are quick to walk away. Several leading VPN providers now use genuine residential IP addresses, typically hijacked from unwitting users who’ve installed free VPN software with trojan software installed, allowing their connection to be resold to the highest bidders. Beyond the obvious security issues this creates, it makes anonymizers virtually impossible to block – as doing so also blocks millions of genuine users. In summary, the geo-pirates currently have the upper hand. The real resolution to this game is an evolution in geo-blocking. By looking at multiple user data points; IP, GPS, Wifi and Cellular, logic can be applied to generate a highly accurate decision on whether the user should or shouldn’t be authorized. Other industries, such as online gambling, have embraced this approach – permanently putting a stop to geolocation fraud. 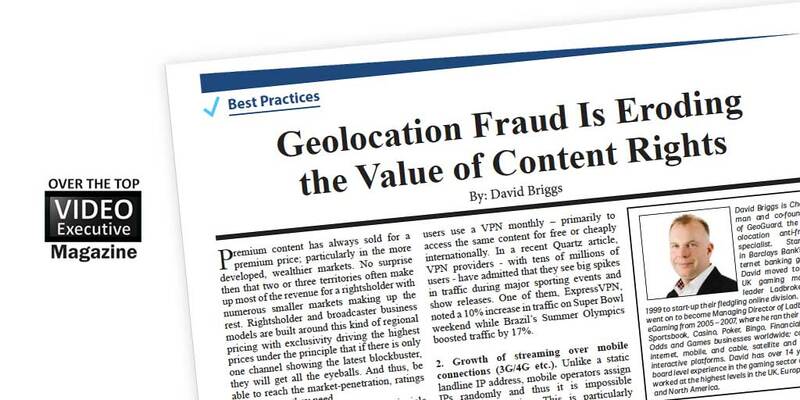 David Briggs is CEO of GeoGuard, the geolocation anti-fraud specialist. Starting in Barclays Bank’s internet banking group David moved to join UK gaming market-leader Ladbrokes in 1999 to start-up their fledgling online division. David went on to become Managing Director of Ladbrokes eGaming from 2005 – 2007, where he ran their online Sportsbook, Casino, Poker, Bingo, Financial Fixed Odds and Games businesses worldwide; covering internet, mobile, and cable, satellite and WebTV interactive platforms. David has over 14 years of board level experience in the gaming sector and has worked at the highest levels in the UK, Europe, Asian and North America. Read the entire magazine by clicking here.